Darren Aronofsky'sNoah (2013) was an opinionated film chock full of dark cryptic extra-biblical mysticism and environmentalist concerns often feeling like propaganda for something. 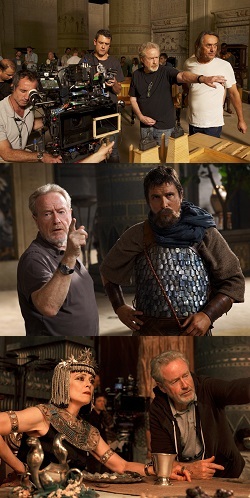 Ridley Scott's Exodus: Gods and Kings, on the whole, is a much different film. His “sword and sandal” epic is surprisingly restrained, subdued, and filled with a genuine wrestling with the Biblical story of Moses. It is a reflection of Scott as a recovering atheist who is agnostically struggling with materialism and the possibility of the Divine. At first blush the film seems to rest on the razor's edge of mystery and coincidence, however in the end God wins. The key challenge presented by the film rests in the old adage, "He cannot see the forest for the trees." In Scott's case it appears he’s had a good glimpse of the "forest" but it's often the Biblical details—the "trees” in the Exodus account—that suffer. 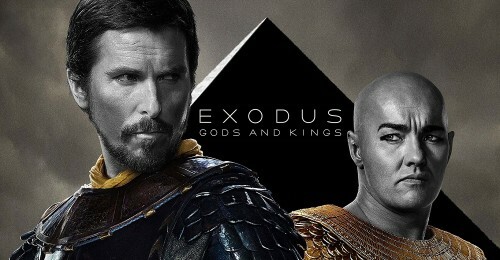 Exodus: Gods and Kingsprovides no sweeping prologue rather opting to jump into the story of Moses (Christian Bale) as a grown man clearly instructed in all the wisdom of the Egyptians, mighty in his words and deeds. He is an Egyptian general beloved by the Pharaoh Seti (John Turturro), and is the close confidant of the Pharaoh's son Ramses (Joel Edgerton). Even though Moses is not one of Pharaoh's sons, Seti treats him as one and even privately favours Moses over Ramses who he sees as poorly suited for leadership. Early in the film, before the Battle of Kadesh, Seti gives both men a sword with their names engraved on it, giving Moses' sword to Ramses and Ramses' sword to Moses charging them to look after each other. The relationship between the two men becomes one of the major driving forces in the unfolding narrative as the director tells his story of God rescuing the Hebrews from Egyptian slavery. 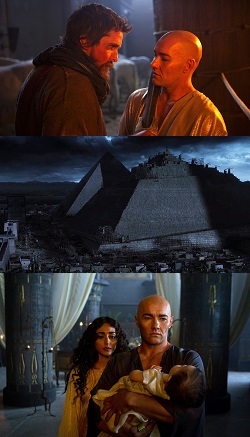 Scott's foreshadowing in the first act of the film employs dramatic irony to great effect thoughtfully setting up the tragic future demise of the brotherly relationship between Moses and Ramses. When screen writers sit down to pen a movie about Moses and the Exodus this brotherly relationship is an oft-repeated Hollywood theme. While it's found in popular adaptations like Cecil B. DeMille's The Ten Commandments (1956) and DreamWorks’ The Prince of Egypt (1998) it's really a speculative invention. Scripture doesn't name Moses' adoptive Egyptian mother or her father the Pharaoh, or the Pharaoh to whom Moses eventually returns some forty years after his flight to Midian. In fact, Scripture is silent both as to Moses' family situation while growing up in Egypt and to what impact, if any, it had on his returning to Egypt. Scott, like other filmmakers before him, includes this for dramatic purposes but Scripturally speaking it is a theme not explored in the Bible. However, the Book of Genesis does record other brotherly conflicts—Cain and Abel, Jacob and Esau, Joseph and his brothers—which makes it a recurring Biblical theme. 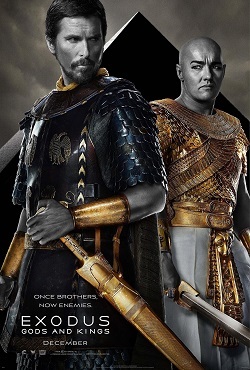 In other moments,Exodus: Gods and Kings, seems to import Biblical themes and character traits for dramatic effect. For example, Scott's depiction of Moses contains echoes of Abraham and Jacob particularly in their personal wrestling with God in times of trial and danger. At one point a corrupt Egyptian official (Ben Mendelsohn) complains about the Hebrew slaves saying that even their name is combative. He notes that Israel means “he who fights with God,” to which Moses responds, "No, it means to wrestle with God." This thread ties Scott’s Moses back to the patriarch Jacob whose name God changed to “Israel” after Jacob literally wrestled with Him. Moses, while instructed in all the wisdom of the Egyptians, is shown as a-religious—a man who knows about the religious beliefs of the Egyptians and the Hebrew slaves who he's destined to save, but who doesn't believe in any of them. Rather, Moses values the modern virtue of "believing in yourself." This changes after he suffers an accident on the side of a mountain while shepherding a flock of sheep. In the accident Moses acquires a head injury and from that point he sees a messenger of God in the form of a young shepherd boy (Isaac Andrews). It’s important to remember that Scripture doesn't attribute Moses' relationship with God to a head injury! Is there a burning bush in Scott's film? Yes, but Scott's Moses receives no staff from God with which to work wonders, and no clear direction of exactly what he is expected to do upon returning to Egypt. This seminal scene in the story contains the largest number of departures from the Biblical narrative. The burning bush encounter in DreamWorks’The Prince of Egypt has a higher degree of Biblical fidelity while still allowing for some rather successful artistic interpretation of the text. Some viewers may mistake the mysterious shepherd boy for God but Scott envisioned him as a messenger intended to be a sort of angel God uses to speak directly to Moses and who Moses alone can see. Moses' relationship to this messenger begins in fear, moves to antagonism, and eventually appears to be one of camaraderie. This eventually affable relationship may draw to mind Exodus 33:1, which says "The LORD used to speak to Moses face to face, as a man speaks to his friend," or Abraham's interaction with the LORD at the beginning of Genesis chapter 18. This approach to Moses' relationship with God through a mediating angel may also explain some of Christian Bales’ comments about the character of Moses he plays. Prior to the film's release Bale said, "I think [Moses] was likely schizophrenic." While it certainly sounds as though Bale is speaking of his character's motivations from a purely materialistic modern viewpoint, filmgoers will want to ask “What does the film on a whole end up saying?” Viewed as a whole it becomes apparent the events unfolding in the film can't be explained by one man's delusion. For example, Scott depicts the ninth plague(darkness) and the tenth plague (death of the Egyptian first-born and sparing the Israelite first-born) as events with no naturalistic explanation. When Moses returns to Egypt, and Pharaoh refuses to let the Hebrew slaves go, all ten plagues are shown in vivid detail. However,while he wrestles with how to depict this Scott often provides an initial materialist explanation: the blood in the Nile begins with an onslaught of crocodiles which the Egyptians blame for setting off a chain reaction of terrible plagues. That said, what is clear is that the Nile river which the Egyptians worship as a source of life becomes, by the hand of the Hebrew God, a fountain of death to the embarrassment of Pharaoh and his advisors and the 'gods' they serve who are proven to be mere idols. Scripturally speaking the Egyptian magicians recognize "the finger of God" at work while in the film they, and the rest of Pharaoh's advisors, remain in denial. A careful look at this part of the film provides this insight: Scott has made the plagues into a series of events in which God works through means. There is real blood in the water, real flies, frogs and boils. None of it is “spiritualized” and by the end of the plagues it’s clear God is in command of it all. In fact, when Moses first returns Scott has him trying to rescue the people by guerrilla warfare echoing the sentiments of Acts 7 where Scripture says, "[Moses] supposed that his brothers would understand that God was giving them salvation by his hand, but they did not understand." In Scott's film Moses learns this lesson alongside the people: their rescue would ultimately come from the hand of God not by human ingenuity, persuasion, or unguided-random-naturalistic-coincidence. If viewers want to look for discrepancies with Scripture the list goes on and on. For instance, Moses doesn't spend forty years away from Egypt and Moses' wife Zipporah (Maria Valverde) and their son Gershom don't accompany him back to Egypt. As a result, Moses doesn't appear to be eighty years old when he returns. To identify the Pharaoh as Ramses II, Scott places the narrative on the backdrop of 13th century BC which conflicts with the traditional date of the 15th century BC, a later date arrived at by internal Biblical evidence. The film is essentially Ridley Scott's character study of Moses; a man moving reluctantly from being a-religious to becoming a man of faith. 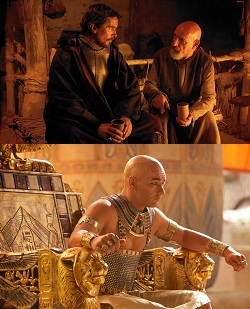 In the film's first act Joshua's father, Nun (Ben Kingsley), asks Moses, "Do you believe in coincidence?" to which Moses answers, "As much as I believe in anything else," Nun replies, "I don't believe in coincidence." God in Scott's film is initially rationalized away as a powerful and compelling delusion. However at the film's apex, the death of the Egyptian first-born, Scott presents God as a Divine being completely outside Moses, something beyond what Moses could conjure up in his mind as the result of a head injury. In one of the film's most powerful moments both Ramses and Moses recognize there was no coincidence in the fact that none of the Israelite children died in the last plague, and God was diligently rescuing Israel, His “first-born son,” out of slavery. In spite of all the film’s adjustments to the Biblical account the fact Scott so powerfully and faithfully depicts this crucial part of the Scriptural narrative can be applauded. It is also telling of his personal move from outspoken atheism to open agnosticism. To put the best construction on the film and its production, Scott seems to be "a bruised reed" by the banks of the Nile river, and while the film doesn't burn with the light of a pillar of fire by night, the "faintly burning wick" of hope Scott presents requires some thoughtful consideration by Christian viewers who may want to think about the people in their own lives who are precariously beginning to seek God where He may be found. In this case, in making Exodus: Gods and Kings, Scott grasped hold of the LORD and wrestled with Him. Pray this wrestling match will be as successful for Scott as it was for the Old Testament patriarch Jacob. In an interview with VarietyScott said, “I always try to place myself in the position of the central character, and try to come at it from my own logic,” Moses like Jacob "wrestled" with God and it appears Scott in making this film has made a genuine attempt to “walk a mile” in their sandals. 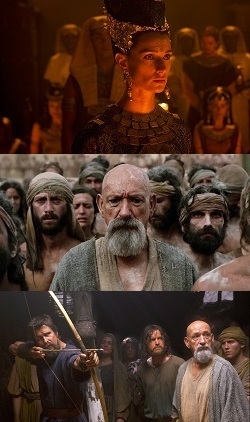 In the end, with its many deviations from Scripture, Scott's Exodus: Gods and Kingscan't be recommended as a “devotional” film. It is however a superior film to Aronofsky'sNoah and may serve as fertile ground for conversing with others about the nature of faith, God and redemption. If the plan is to sit down together as a family to watch a movie about the Exodus the best bets may still be DreamWorks’ The Prince of Egypt (1998) or Cecil B. DeMille's The Ten Commandments (1956). However be warned: these films also take liberty with the Scriptural text and likewise indulge in creative licence. For a true encounter with Moses and God's liberation of the Children of Israel from their slavery in Egypt read the Biblical book of Exodus, the Acts of the Apostles' Chapter 7 and Hebrews chapter 11. As always when watching any of these films it is recommended to go back to read again what Scripture teaches and not take what the film presents as “gospel” truth regardless how beloved the film may be personally or by the culture-at-large. The Rev. Ted Giese is associate pastor of Mount Olive Lutheran Church, Regina, Saskatchewan, Canada; a contributor to Reformation Rush Hour on KFUO AM Radio, Canadian Lutheran and Reporter; and movie reviewer for the “Issues, Etc.” radio program. Follow Pastor Giese on Twitter @RevTedGiese. Acts 7:22, "Moses was instructed in all the wisdom of the Egyptians, and he was mighty in his words and deeds." Genesis 32:22-32 "The same night [Jacob] arose and took his two wives, his two female servants, and his eleven children, and crossed the ford of the Jabbok. He took them and sent them across the stream, and everything else that he had. And Jacob was left alone. And a Man wrestled with him until the breaking of the day. When the Man saw that He did not prevail against Jacob, He touched his hip socket, and Jacob's hip was put out of joint as he wrestled with Him. Then He said, “Let me go, for the day has broken.” But Jacob said, “I will not let You go unless You bless me.” And He said to him, “What is your name?” And he said, “Jacob.” Then He said, “Your name shall no longer be called Jacob, but Israel, for you have striven with God and with men, and have prevailed.” Then Jacob asked Him, “Please tell me Your name.” But He said, “Why is it that you ask My name?” And there He blessed him. So Jacob called the name of the place Peniel, saying, “For I have seen God face to face, and yet my life has been delivered.” The sun rose upon him as he passed Penuel, limping because of his hip. Therefore to this day the people of Israel do not eat the sinew of the thigh that is on the hip socket, because he touched the socket of Jacob's hip on the sinew of the thigh."